Ørsted has sold 50% stakes in two offshore wind farms and two lease areas off the US's north-east coast to New England utility Eversource for around $225 million. 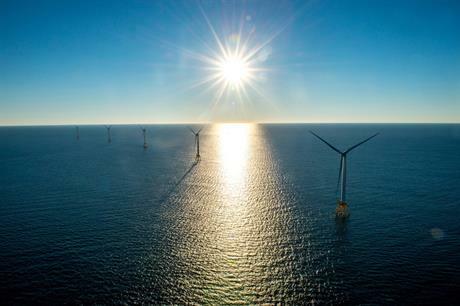 The divestment includes stakes in the 704MW Revolution Wind site, the approximately 130MW South Fork project, and two undeveloped lease areas off Massachusetts, which Ørsted claims could be developed for up to 1GW of offshore wind capacity. A 400MW portion of Revolution Wind will deliver output to Rhode Island, with generation from the 304MW remainder going to Connecticut. Subject to permitting, securing power purchase agreements and final investment decisions, it is expected to be commissioned in 2023. Ørsted bought South Fork through its acquisition of US developer Deepwater Wind in October 2018. The project, which the Danish company claims will have a capacity of roughly 130MW, will deliver power to the Long Island Power Authority in New York. Ørsted and Eversource expect it will be commissioned by the end of 2022. The Danish developer also acquired the two lease areas off the coast of Massachusetts from Deepwater Wind. Eversource has partnered with Ørsted in the US since 2016. The two companies have previously agreed to work together on a 50:50 basis on the 1GW Bay State Wind site. Eversource is also due to buy power from Ørsted’s 800MW Vineyard Wind off Massachusetts' south coast. A contract for the Revolution Wind site has been filed with the Rhode Island Public Utilities Commission (PUC), the state governor’s office confirmed. Ørsted and Eversource are due to sell power from a 400MW portion of the project to grid operator National Grid, having been successful in the state’s request for proposals in May 2018. Revolution Wind will generate electricity for a levelised cost of energy (LCOE) of $73.68/MWh during its 20-year lifetime, Ørsted confirmed. The $73.68/MWh LCOE is higher than the $65/MWh LCOE of Copenhagen Infrastructure Partners and Avangrid’s 800MW Vineyard Wind site off Massachusetts. Governor Raimondo added that the Rhode Island PUC would review the contract over the next 120 days.